There was a lot going on in K-pop the past week–so much so I had to mention a few because there was just way more than 5 Things out there to love. 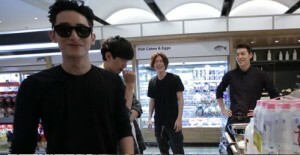 The departure of the Jo Jungchi & Jung In and Jinwoon & Go Joon-hee couples from We Got Married. It was a sad farewell although we did get to see Jo Jung-chi propose and Jinwoon keep his promise to celebrate all the seasons with Go Jun-hee. Their departure makes way for new couples pianist Yoon Han & actress Lee So-yeon and Superstar K4 finalist Jung Joon-young & actress Jeong Yumi. I also have really been enjoying Kim Byung-man’s Law of the Jungle-Caribbean, the parts other than them being eaten alive by tons of mosquitoes, like when Infinite‘s Sung-yeol caught a lobster. They’ve moved on from the Caribbean and are now set to try and conquer the jungles of Belize–I’d pass on the armadillo. Something else that every K-variety fan should keep on their radars is Infinity Challenge’s Infinity Challenge Song Festival where this year the likes of G-Dragon, BoA, Primary, Kim C, Jang Kiha and the Faces, Rose Motel and Yoo Hee-yeol will be collaborating with the cast. On the latest episode the members vied for affections of their guests and let’s just say–it was something not to miss. Been watching YG Entertainment‘s WIN:Who Is Next and am convinced more than ever that the ending won’t be pretty. And lastly, did you know that Lee Soo-hyuk and Hong Jong-hyun have a show on OnStyle called Style Log? On an upcoming episode, the two will have their friends–other models turned actors–Sung Joon and Kim Woo-bin–join them. The following are the top 5 Things that happened in K-pop last week that I thought were a bit more special than the rest. If you’re not up-to-date on your K-pop and don’t like spoilers, turn back now. Lee Juno, one third of Seo Taiji and Boys (the others being Seo Taiji and Yang Hyun-suk), broke it down on the latest episode of Quiz to Change the World and even though he is now 47, he still got it. It was classic when one of the other guests, Kim Ji-seon, joined him to do the choreo from their hit “Nan Arayo,”–showing just how popular they were back in the day. I’d love to see if Papa YG could still move like that. Been a fan of Led Apple‘s Music Note series from the beginning, but some of their covers are definitely more successful than others. Here’s one of their latest and a surprising one–a cover of 80s rock band Skid Row and their classic hit “I Remember You.” Leader and guitarist Young-jun accompanies Han-byul in their cover of the rock love ballad. The last episode of Running Man featured the most guest ever on the show–two members of a popular boy band or girl group per member. It was a toss up for which video to share as there were funny moments throughout the show, but there’s no better place to start than at the beginning, especially when it was so good. Each cast member showed up with their group and did a little intro dance–some were good, some were cute and some… were cringe-worthy. Kim Jong-kook–just can’t. And props to Infinte‘s L, he took out Kim Jong-kook like twice in one game–and he’s like two times bigger than L.
G-Dragon skipped the normal route by making his live debut on Yoo Hee-yeol’s Sketchbook instead of one of the weekly music shows. On the show he performed a “Crayon+Fantastic Baby” medley, “Niliria,” and the first live performance of his newly released song “Crooked.” Wasn’t a huge fan of the song when watching the MV, but the live performance may have just changed my mind. It was a toss up between this live performance of “Crooked” and his live of “Michi GO” on Inkigayo, but decided to go with the newer song. I loved the movie Love Actually just as much as anyone else, but the movie seems to have been iconic in South Korea. If you haven’t seen it already, check out the special ‘event’ that Lee Hyori planned for Lee Sang-soon with her girls from Spica in the last episode of Lee Hyori’s X-Unnie. Love is all you need.